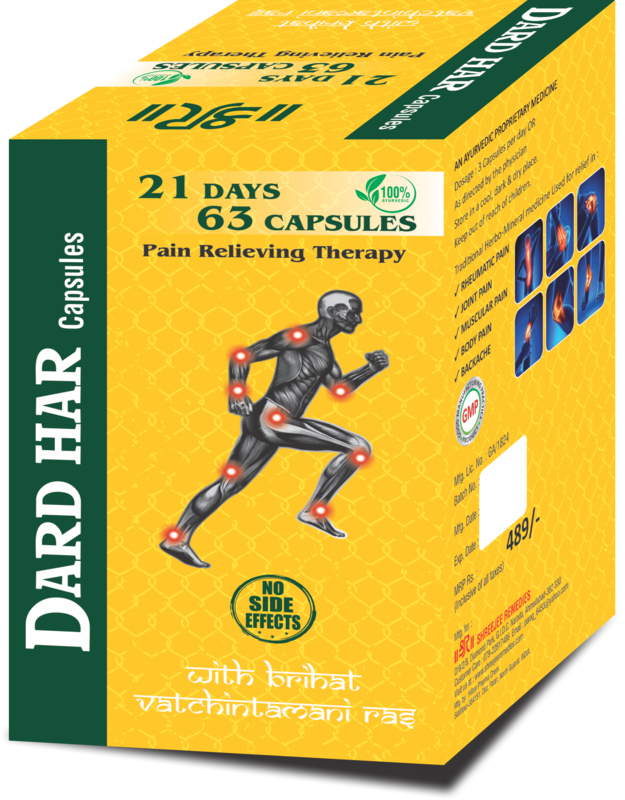 DARD HAR CAPSULES are the mixture authentic medicinal herbs. The combination of Herbo-Mineral medicine is effective to reduce the pain because of therapeutic properties. Intake of Dr. Ortho capsules is useful to heal the pain of knee, lower back, shoulder, neck and other joint. Pain generally occurs due to Vitiation of Vata Dosha. Brihat Vatchintamani Ras (Key ingredient of Dard Har Cap.) removes aggravated Vat from the site. Each herb is loaded with anti-inflammatory properties which help in reducing inflammation, swelling and relieving pain. Furthermore, interrupted metabolic rate improves with these Ayurvedic capsules and this aids in the elimination of the toxins which are the main cause of inflammation. *Simultaneous Use of DARD HAR OIL is recommended for quick relief.